Acne concerns many people, irrespective of age. Successful acne treatment is hard to come by for some. Over the years, many individuals have to come to us with the question ‘why do I get spots all the time’? Many suffer from vicious breakout cycles; the spots appear and seem to improve but then flare up again, for years. In order to remove the spots they try acne treatment cream, facial washes, and visits to the doctor for drug prescriptions that seem useless. However, at Clear Medical, we work with patience and persistence to give you a permanent solution and sustained skin care advice. We endeavour to ensure that you are confident in your skin at all times. Acne is a skin disease where spots infect the same area, develop over a longer period of time and stay longer. It may sometimes leave red marks or scars after healing. “Normal” spots, on the other hand, form quickly, disappear and do not occur in the same place. Mild Acne: comedones (blackheads or whiteheads) which are clogging skin pores. The more the pores become clogged, the more likely it is that bacteria will multiply and lead to inflammatory acne. Moderate Acne: many imflamed pimples, termed “papules” (small bumps) or “pustules” (with a yellow pus filling). Severe Acne: a lot of papules and pustules, as well as nodules on the skin. These nodules are often reddish and painful and can cause scarring. 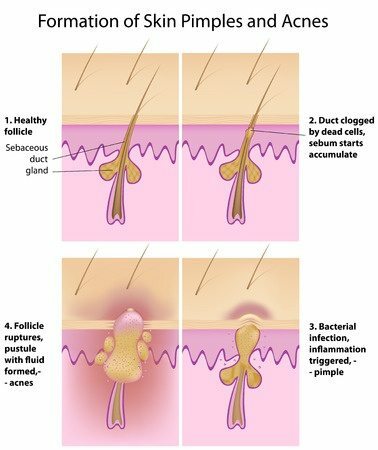 Sebaceous glands produce a natural oil called sebum. This oil acts to protect our outermost skin layer and helps to fortify it. Dead skin build up, dirt, and chemicals causes blocking of the pores and oil release is not possible. As a consequence, triggering of an immune system response leads to inflammation; and a comedone (blackhead or whitehead) forms. Acne mostly develops on areas that have more oil glands such as the face, chest, back, and shoulders. This kind of skin behaviour is most common during puberty when higher levels of the hormone ‘androgen’ are released. Sometimes, the bacteria within the skin are not completely removed by the immune system response which leads to the constant state of appearance and disappearance of the spots. Over sensitization of the skin barrier through chemicals, environmental exposure or skincare regime. Other immune system related pressures or deficiencies. Laser Acne Treatment – detailed below. This specifically targets the bacteria which causes the inflammation and improves the health of the skin. Skin Peels: removes dead skin build-up and improves and eradicates the inflammations. Which Acne Treatment Cream Should I use? We do not recommend acne treatment cream due to chemical risks. You create your skin lotion with our Tone & Defence Formula 100% Natural Skin oil and moist skin– available in clinic and from our online shop. Our natural acne treatment cream does not contain water or risks to your skin health. Moreover, it will nourish, supplement your immune system response, and enhance your skin barrier. Supplementing our natural skin with Our Cellulose Fibre Scrub Mitt, once a week – available in clinic and from our online shop. We can assess and recommend usage depending on your skin health. The Mitt allows you to gently exfoliate dead skin build-up and stimulate cell turnover to reveal healthy balanced skin. Not to mention, we advise that you supplement your skincare routine with a healthy balanced diet and regular exercise. Sensitising the skin barrier and infection with acne, means that we recommend using mild products and gentle care. How Does Acne Laser Work? The Laser Acne Treatment uses pure yellow, green and red light. The light emitted at a specific wavelength destroys the bacteria that live in the skin and cause the acne inflammations. This process involves something called selective photo heating which is done at a specific wavelength of light so as to prevent damage to the surrounding cells. The pulses between shots of light are an important part of laser treatment. Thus, they allow surrounding tissue to cool down, which aids the prevention of damage to the skin. Simply, we are manipulating the bacteria’s characteristics to cause a reduction in the immune system response to the infection. The heating effects of the laser travel deep into the skin which helps to prevent over production of excess sebum. As a consequence there is an increased healthy skin turnover, resulting in reduced oily skin. It is best if you come and see us for a free consultation where we can offer you help and advice on the best treatment for you. Obligation to undertake treatments does not exist, due to our ethics. At a consultation, we fully explain the treatment, assess your suitability and if there are no medical reasons to not proceed, we will offer you a patch test. This allows us to choose a safe, optimal setting for treating you. Most importantly, you will be giving fully informed consent prior to treatment. What Will I Experience If I Choose Laser? Firstly, the treatment begins by gently cleansing the skin. Application of ECG (Electrical Conductivity Gel) assists the penetration of pure white light through the skin. ECG is the same gel which is neccessary during ultrasound scans, it allows the penetration of sound through tissues, producing an image. Your therapist will then select the optimal safe setting based on their assessment of your immune system response and medical susceptibilities. The laser is placed over the area to be treated and a shot of light is emitted at the correct wavelength specific to you. During the session multiple levels of shots may be administered in order to find the setting that will be most effective for you. You will be required to communicate each sensation felt at the administration of the shot. The level of pain that is felt is different for everybody. Some clients associate the sensation to a tolerable pin prick but some others find it quite uncomfortable and painful. This, however, cannot be predicted so the best thing to do is to give it a try. Once you are happy to proceed with treatment we will arrange a suitable appointment for you 5 days after your initial consultation. This gives you that little bit of time to fully consider the advice and treatment we gave you. We carry out your first treatment in the same manner as your patch test and advice on the recommended interval for your next session is always specified. After the first treatment you should notice a difference in the health of your skin, number of inflammations and size of the inflammations. This, however, varies from person to person. Note also, that you may only notice a difference in one of the factors above and not all three at the same time. That is perfectly normal at this stage. We are always available via phone, text or emails if you have any questions. Treatment intervals can vary depending on various factors; the treatment area, skin health and extent of bacterial infection. The number of treatments needed can also vary depending on the individual’s immune system, stress levels, internal and external biological environments, and the time between each treatment. We will keep you fully informed throughout the treatment process and will discuss with you our expectations on how long the treatment may be necessary. From our experience, clients typically have 1-8 treatments which take place every 2-4 weeks. Clear Medical offers acne treatment with care, knowledge and experience and always with the client’s best interests in mind. Also, the quality of treatments provided, always pleases our clients. Lack of regulation within this industry, makes it difficult to find specialists who genuinely care about the client as well as their business. We hope we can help you eradicate your acne and stop you from wasting money on acne treatment cream. Whether that means a simple reduction or complete elimination of skin inflammation. Our team care about you and that is why we want you to be able to have the time to enjoy life without the worry of skin irritation and infection. Clear Medical Clinic provides a clean, relaxing and friendly environment, which provides you with the perfect setting for advice, care and treatment.